Two weeks ago it was a usual Wednesday morning. I woke up at 6am so that I could drive the kids to school in St. Marys. As often the case, we were rushing and rushing, and not all the kids were moving very fast at these early hours of the morning. Finally, I told one that if he wasn't ready, we were just going to leave him at home. As I said this, I started out the front door to the car. I was carrying my usual lunch (a sandwich) and two mugs, one with coffee, the other vegetable juice. This particular morning it had been raining, and the water was still pooled on the painted concrete steps in the front of our house. As I went marching down the stairs, my feet flew out from under me, my hands full, grasping my lunch and drinks. BANG! My elbow hit the concrete step. SNAP! My back hit the edge of the step. I continued sliding down. Moving in pain, I forced myself up and in a haze I stumbled back up the stairs into our house. I could hardly breathe, I could not speak. The pain felt as if I had broken something. Lisa rushed over to me, frantically asking me what was wrong. I kept trying to tell her as I gasped for air, but could not force out the sound. Finally, I gasped, "I fell." I tried to lay on the couch, my back was in severe pain. Eventually, when I was able to breathe more normally, I told Lisa what happened. Later she told me that she thought I was having a heart attack. Lisa told me we should go to the emergency room. I did not want to, however. I was breathing, was not shot nor stabbed, I thought, so I could wait. At this point I remembered that I was supposed to be taking the kids to school. If we left now, they would only be a little late. I told Lisa that we could drive to St. Marys and stop by the clinic there. So we drove the 30 miles as I sat in the van seat, feeling every motion, every bump. When we got there, we dropped off the kids and then Lisa brought me to the doctor. At this point, moving was not something I enjoyed, but I went to the office room, then to the reception, then to x-ray, and then back to the office. 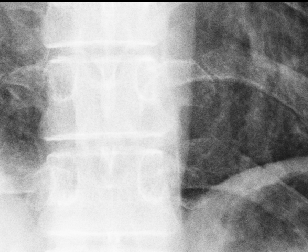 The doctor came and exclaimed that I had two broken ribs. He gave me a brace and a prescription for pain medication. That afternoon I was back at work for a couple of hours. Two days later, we moved. I think I'm going to give them a bit of a rest now though so they can heal! And that, folks, is why you never ask for a break!